Catherine Opie (b. 1961 Sandusky, Ohio) received her BFA from the San Francisco Art Institute in 1985, and an MFA from California Institute of the Arts, Valencia in 1988. In 2000, she was appointed Professor of Fine Art at Yale University, and in 2001 she accepted the position of Professor of Photography at the University of California, Los Angeles, which she currently holds. 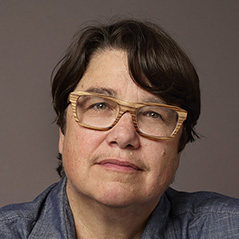 Catherine Opie's photographs include series of portraits and American urban landscapes, ranging in format from large-scale color works to smaller black and white prints. Moving from the territory of the body to the framework of the city, Opie's various photographic series are linked together by a conceptual framework of cultural portraiture. Her work has been exhibited extensively both nationally and internationally. In 2017, a survey exhibition entitled, ‘Catherine Opie: Keeping an Eye on the World,’ was on view at the Henie Onstad Art Center in Oslo, Norway. Recent solo exhibitions have been organized by MOCA Pacific Design Center, Los Angeles; UCLA Hammer Museum, Los Angeles; Los Angeles County Museum of Art, Los Angeles; Solomon R. Guggenheim Museum, New York; Aldrich Museum, Ridgefield, CT; Museum of Contemporary Art, Chicago; Walker Art Center, Minneapolis; Saint Louis Art Museum, St. Louis; The Photographers’ Gallery, London; The Museum of Contemporary Art, Los Angeles; Institute of Contemporary Art, Boston; Long Beach Museum of Art, Long Beach; and the Wexner Center for the Arts, Columbus. In October 2016 she completed a monumental installation for the new Los Angeles Federal Courthouse. Opie has received numerous awards, including the Smithsonian Archives of American Art Medal (2016); Julius Shulman Institute Award for Photography (2013); Women’s Caucus for Art: President’s Award for Lifetime Achievement (2009); United States Artists Fellowship (2006); Larry Aldrich Award (2004); Washington University Freund Fellowship (1999); and the Citibank Private Bank Emerging Artist Award (1997). Her work is included in the permanent collections of many museums worldwide, such as the Museum of Contemporary Art, Los Angeles; Los Angeles County Museum of Art, Los Angeles; Museum of Modern Art, New York; Solomon R. Guggenheim Museum, New York; Whitney Museum of American Art, New York; Tate Modern, London; Walker Art Center, Minneapolis; San Francisco Museum of Modern Art, San Francisco; Israel Museum, Jerusalem; and Centro Cultural Arte Contemporáneo, Mexico City; among others.